The Singapore dollar is expected to stay weak in the coming months, weighed down by the region's sluggish economic growth and a further weakening of the Chinese yuan. Analysts painted a cautious outlook for the local currency even though the United States dollar may not have much room left to extend its recent rally. The Singdollar stood at $1.3743 against the greenback on Friday night after a 1.9 per cent gain by the US dollar in the past month, due partly to market expectations of an imminent American interest rate hike. The US dollar run is likely to be temporary, ABN Amro said in a report last week, adding: "If the Fed were to hike rates this year, it will be gradual. A 25-basis-point hike this year is now roughly priced in by financial markets." But this does not mean that the Singdollar, which is managed against a basket of major currencies such as the US dollar and the euro, will take off from here. "Where I think the Singdollar weakness will come in is through the US dollar strength against the yuan. The Chinese economy is still slowing down and there is unlikely to be any rebound from the recent stabilisation," Bank of Singapore senior currency strategist Sim Moh Siong told The Straits Times. He added: "One way to cushion the slowdown is to allow the yuan to weaken, which we think will happen even though the pace will be more controlled compared with the volatility last year. The Singdollar will then be dragged along with other Asian currencies in the medium term, due to the regional economies' strong links with China. "We forecast the Singdollar to be at $1.40 against the US dollar in six months and $1.43 in 12 months." BMI Research also puts the Singdollar at $1.40 against the American currency by the end of the year. It noted last week that while the greenback does not have much more room to rise, the Singdollar will likely dip due to various factors, including the weakening yuan and a more fragile global economy. The US dollar has gained almost 6 per cent against the yuan over the past year since the Chinese central bank launched several rounds of currency depreciation. With that pressure on its back, the Singdollar is also unlikely to rise significantly against key regional currencies. It could be at $2.90 against the Malaysian ringgit 12 months from now, Mr Sim noted, lower than last Friday's $2.9689. "The scope of a sharp fall to the Australian dollar is also limited," he said. "The economy has held up surprisingly well against the impact of the Chinese slowdown, due partly to the interest rate cut there." 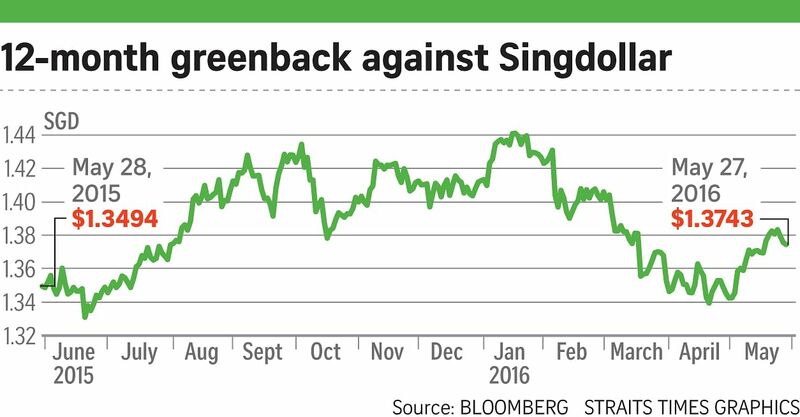 Mr Sim sees the Singdollar at $1.03 against the Aussie in 12 months, compared with 99.11 cents last Friday.